The Atlanteans created an amazing culture and technology far beyond the reach of any other ancient civilization. When the game begins, all these wonders, your culture, are being threatened by catastrophe. Save your ancient legacy and settle on safe lands before the water sinks everything you have created. 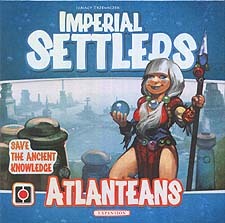 With Imperial Settlers: Atlqanteans you gain access to a brand new faction with its own goals and method of development. Also included, are cards to expand the 4 base game factions, as well as the common deck with new traits and card types compatible with the Atlanteans. The end is near. Try to survive it!